This resource is for ecommerce stores who want to reduce abandoned carts, improve usability and close more orders that enter the shopping cart. We analyze your checkout user experience across six checkout usability categories and score it according to 134 guidelines based on usability reviews of 6000+ checkout elements on 50 leading ecommerce sites: Home Depot, Staples, HP, Walmart, Crutchfield, Target, Best Buy, Sears, Cabela's, Apple, Costco, Dell, Amazon and 37 more. 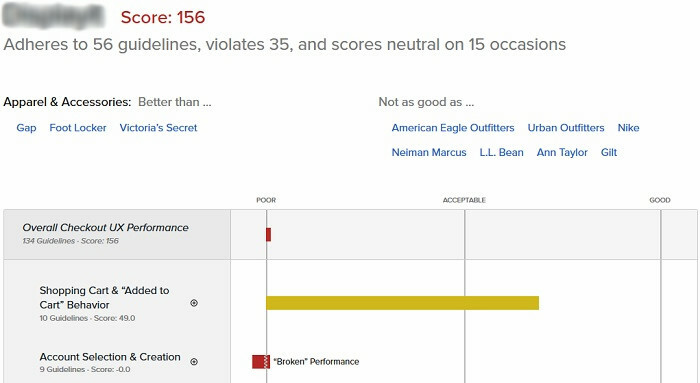 Here's a snippet from a scored ecommerce checkout usability review (details for each of the 134 items is not viewable in the image).